If you live in Melbourne you’ve probably seen the new (-ish) advertisements Yarra Trams is running. Whoever came up with the skateboarding rhino idea should be congratulated. I think it’s a great mental image to get the message (don’t play chicken with trams) across. However, whoever came up with the print ad that’s been running lately (below) ought to be shot. It’s poorly worded and anything but memorable. If a rhinoceros on a giant skateboard was heading your way, you’d get out of the way, right? Well guess what, a tram weighs about the same as 30 rhinos so it’s not something you want to get hit by. The first paragraph I don’t mind so much, it’s the second I object to. So here’s my rewording. A tram weighs almost the same as 30 rhinos, all riding the same skateboard. Imagine getting hit by that. Be out of the way, not in it. What do you think? Does anyone have any better suggestions? 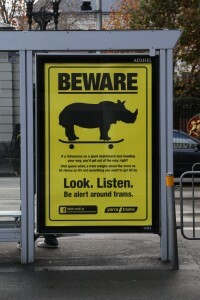 A tram is equivalent to 30 rhinos all riding a single skateboard. Are there any ads around that you’ve re-written or would re-write if you could? I haven’t rewritten any ads around here. I usually pay the most attention to billboards when I’m in Sweden, however, my Swedish isn’t good for improving on their phrasings.